Are you seeking the best kind of craft paint for glass? I’m with you! I’m ready to start painting again since winter began and I’ll have to put my outdoor craft fun on hiatus :P. Gotta roll with the punches. By the way I love to paint no matter what time of year it is – main thing I notice is it takes longer to dry. Anyway, I’ve been wanting to give my glass jar collection a new makeover but you can’t just use the same kind of paint you would use on wood….You need a different formula as glass is slick and smooth and it takes a different kind of paint to stick to it, especially permanently. 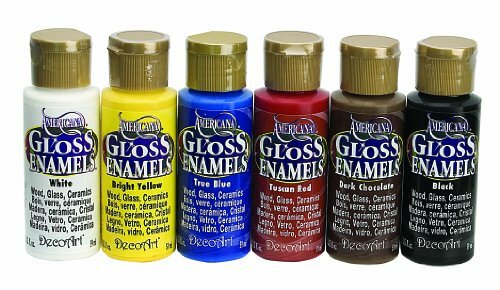 You Need Enamel Based Paint For Glass! You Can Put Objects with this Glass Craft Paint into the Oven! 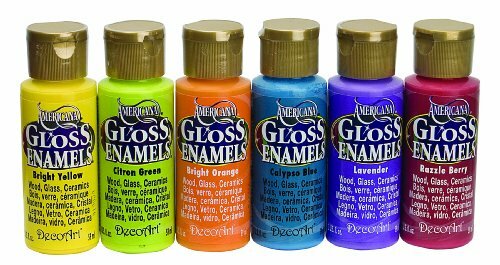 To paint on glass like a real boss, you need enamel paint. 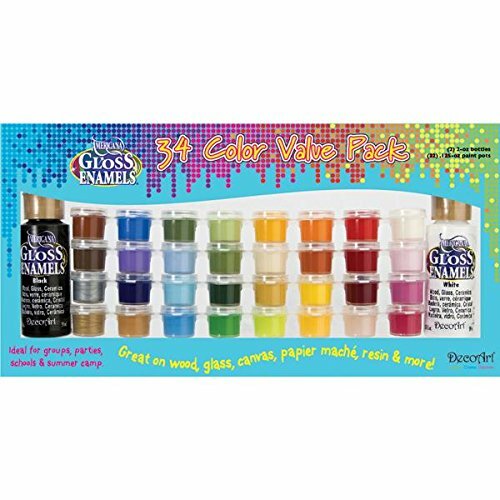 So last night I brought home some of these from Hobby Lobby – I had to do diligence first so I would get the right kind of paint to use on glass. It is water-based, but formulated a little differently. I have some real cute little yoghurt jars I’ve kept that I wanted to experiment with before I go onto the more ambitious stuff like mason jars. So here I go! Pro Tip – after you wash your jars out, and remove any label stickers if necessary, apply a little rubbing alcohol first. It helps the paint to stick better to glass. Painting on glass is kind of tricky, because you can see through it and thus flaws like brush marks, air bubbles, stuff like that. It’s different from opaque nonporous objects that give you a little more leeway and a chance to correct errors. Now for the frosted glass paint…..As I discovered, it’s pretty thick. It’s also got a little bit of an odor to it – more so than the original types I talk about which have hardly an odor to them unless they get old. Don’t worry, it’s also non-toxic though! I ended up adding a little water to it to thin it enough to be able to swirl it around so I could give this cute little glass jar a real color tint. Emphasis on “a little” – you don’t want the paint to be too thin or it will be easier to see flaws like bubbles, color overlaps, ridges, etc. But it will prevent chips or peeling, and should be top-rack dishwasher safe if you decide to wash them. The Frosted Glass paint has directions on the label to “cure for at least an hour, bake in oven for 350 degrees for 30 minutes” But the standard Gloss Enamel colors give different instructions: Let cure for 4 days and bake in oven 350 degrees for 30 minutes. When it comes to things that are more delicate like glass, yep – I can be a stickler for doing things the right way. Do I like these? So far – yes! It’s a little different approach though. I don’t use a brush; but a sponge applicator appears to work good to distribute the paint without leaving ridges and marks. You can do likewise; with its thick consistency use this kind of paint in combination with stencils, blend different colors together to achieve a desired shade, and cleanup seemed pretty easy. I washed it off my hands with soap and water. Hope you enjoy! 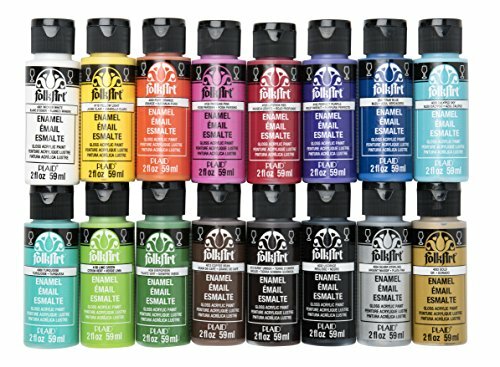 Get some of this paint today… Do you want to create solid and opaque, or frosty looking, or transparent looking effects? You’ve got it! Get creative and see what you can come up with next time you are painting jars, vases, bottles, and more!